I get nervous wearing white. White is a dirt magnet. 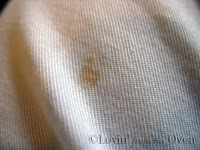 All I have to do is step outside and dirt immediately jumps out and attaches itself to my white clothes. 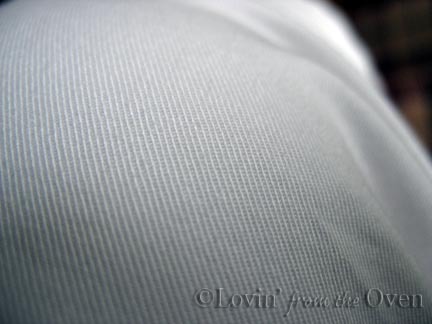 I wore these cute white capris to a BBQ and within minutes, I had a BBQ polka dot on my pants. I dabbed it with water and a napkin, but it was still there. 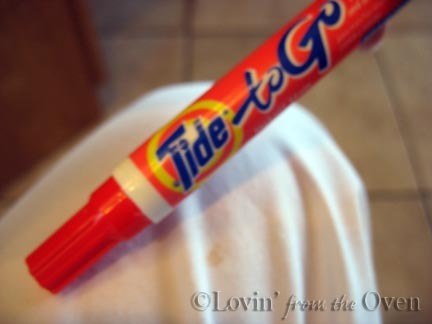 When I got home, I realized that I had a Tide to Go pen, a gift from a friend. Rubbing the tip over the stain didn't do anything. Note to self: Don't push so hard. Dabbed it with a clean napkin. I'm carrying one of these pens wherever I go. I thought that Tide pen was going to be a gimmick too.... but it really does work! 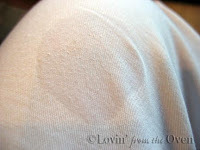 That's better than Shout Wipes...the mark doesn't go away, it leaves cloth fibers on your clothes, and...well I'm amazed. Great tip. I have one in each of my purses. I love them. 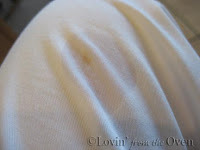 A few food bloggers went to lunch and I was able to offer one to someone who needed it. I was just happy it wasn't me!